The Contractor for the Connecticut DOT has scheduled a detour for Route 25 from Friday April 5, 2019 starting at 7:00 pm to Monday April 8, 2019 9:00 am for work to replace a bridge. DOT approved allowing the detour to be extended up to 9:00 am Monday only if sufficient work can be completed to eliminate one of the remaining weekend detours. If that is not possible, the detour will end by 6:00 am Monday. 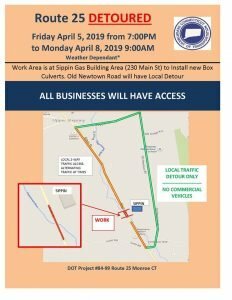 ALL business access for properties located within the construction zone will remain open, although traffic will only be able to access from one direction or the other on Route 25 . Please see the image below for detour location and route.